Tonight I have a surprise baby shower to go to. It’s a potluck and at first I thought I would make a salad but a few hours later, I changed my mind. I decided I wanted to make some cupcakes. As always, I love making desserts for potlucks because it is the perfect excuse to share something that I don’t really want to (well, I want to, I just shouldn’t) eat a whole batch of. On the hunt for a cupcake recipe, I went straight to one of my favourite blogs: My Name is Yeh. I have been a fan of Molly’s food photography and writing for a long time now but surprisingly, I have never actually made anything for her website. After trawling through her recipes to learn as much as I could about cupcakes, I noticed that there was a lot of consistency in the base recipe, which must mean it’s awesome right? 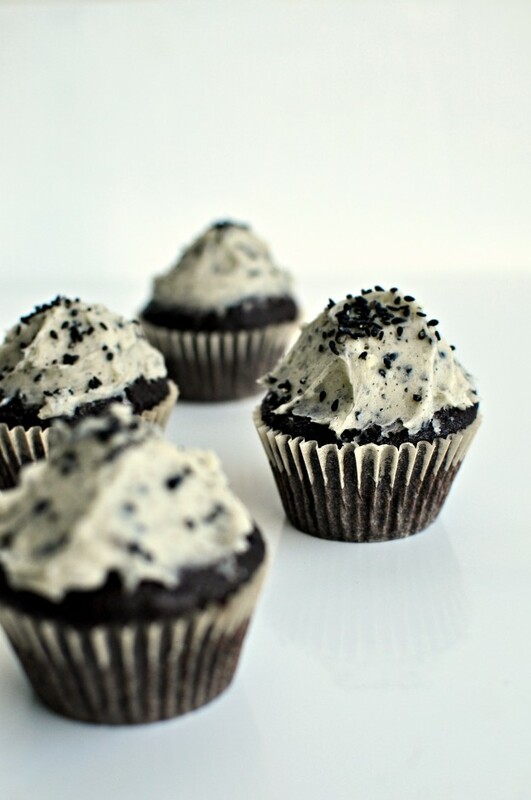 The only other thing to figure out was some exciting flavours to use and today I’m sharing the black sesame chocolate cupcakes, later this week I’ll also share the earl grey vanilla cupcakes that I made to go with them. This entry was posted in Dessert, Potluck Dishes and tagged black sesame, black sesame cupcakes, black sesame cupcakes recipe, black sesame recipe, Chocolate, chocolate cupcakes, chocolate cupcakes recipe, cupcake recipe, cupcakes, Dessert, food, magnolia bakery, magnolia bakery chocolate cupcake recipe, magnolia bakery cupcake, magnolia bakery cupcake recipe, magnolia bakery recipe, moist chocolate cupcake, original cupcake, original cupcake recipe, recipe, rich chocolate cupcake, rich chocolate cupcake recipe, Sweet on December 21, 2015 by mysecondbreakfast.